استادیار، گروه روانشناسی، دانشگاه پیام ‌نور، تهران، ایران. مقدمه: اعتیاد یکی از مهم‌ترین انحرافات اجتماعی است که پایه و اساس بسیاری از آسیب‌ها و مُعضلات اجتماعی در سطح جامعه است. دانشجویان به دلیل شرایط خاص از جمله دوری از خانواده، وارد شدن به مجموعه­ای بزرگ و پُرتنش، مشکلات اقتصادی و نداشتن درآمد کافی مستعد از دست دادن سلامت هستند. هدف پژوهش حاضر پیش‌بینی گرایش به اعتیاد و اختلالات مرتبط با مواد در دانشجویان دانشگاه پیام نور شهر کرمانشاه بر اساس اختلال اضطراب اجتماعی و کیفیت زندگی بود. مواد و روش‌ها: پژوهش حاضر از نوع توصیفی و جامعه آماری پژوهش شامل کلیه دانشجویان مشغول به تحصیل در مقطع کارشناسی دانشگاهپیام نور کرمانشاه در سال 1395 بود.با روش نمونه­گیری تصادفی ساده، 290 نفر انتخاب و پرسشنامه‌های اضطراب اجتماعی، کیفیت زندگی و سنجش رفتارهای پُرخطر تکمیل گردیدند. داده‌ها با روش‌های آمار توصیفی، ضریب همبستگی پیرسون و رگرسیون چندگانه تحلیل شدند. یافته‌ها: میزان شیوع اضطراب اجتماعی 22 درصد بود. 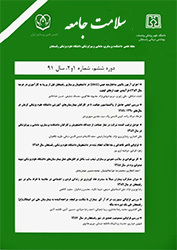 بین اختلال اضطراب اجتماعی و استعداد به اعتیاد رابطه مستقیم و معنی­دار وجود داشت (78/0=r، 72/0=β، 001/0>p). همچنین، بین نمرات پایین در کیفیت زندگی با استعداد به اعتیاد رابطه معکوس و معنی دار بود (69/0-=r، 54/0-=β، 001/0>p). نتیجه‌گیری: شیوع اختلال اضطراب اجتماعی در دانشجویان شهرکرمانشاه در مقایسه با سایر پژوهش‌های انجام گرفته در داخل و خارج از کشور قابل ملاحظه است. نتایج نشان داد اختلال اضطراب اجتماعی و کیفیت زندگی نقش مهمی در پیش­بینی آمادگی به اعتیاد دارند؛ بنابراین می­توان انتظار داشت که با آموزش این مهارت ها به دانشجویان از این معضل خانمان سوز جلوگیری کرد. Assistant Prof, Dept. of Psychology, University of Payame Noor, Tehran, Iran. Introduction: Addiction as one of the most important social deviances is increasingly becoming the basis of many social problems and f harms. Due to changing of their socioeconomic status, students seems to be more prone to the health-threatening habits and behaviors including opium addiction. The aim of this study was to predict the tendency to addiction and related disorders in students of Kermanshah University of Payame-Noor based on social anxiety disorder and quality of life. Materials and Methods: In this descriptive study, 290 undergraduate students of Kermanshah University of Payame-Noor were included using simple random sampling method. The data gathering tool was the questionnaires of SPIN, WHOQL-26, and YRBS. The data was then analyzed using multiple regression, earson correlation coefficients and 21-SPSS software version 21. Results: Twenty-two percent of the participants had social anxiety disorder (SAD). There was a direct and significant relationship between addiction tendency and SAD (r=-0.78, B=0.72, p<0.001) and also low scores of the quality of life (r=-0.69, B=-0.54, p<0.001). Conclusion: Our findings showed that the SAD and poor conditions of life may prone students to opium addiction or other antisocial behaviors. So pre-university education courses for students seems to be of paramount importance. LeNoue SR, Riggs PD. Substance abuse prevention. CAPC 2016;25(2):297-305. Galanter M. Innovations: alcohol & drug abuse: spirituality in Alcoholics Anonymous: a valuable adjunct to psychiatric services. Psychiatric Services 2006;57(3):307-9. Farimah Rezaei M, Pazhuheian F. Burden of drug and alcohol use disorders in Iran: Findings from the Global Burden of Disease Study 2010. AIM2015;18(8):480-5. Slobodskaya HR, Semenova NB. Child and adolescent mental health problems in Tyva Republic, Russia, as possible risk factors for a high suicide rate. ECAP 2016;25(4):361-71. Heimberg RG, Hofmann SG, Liebowitz MR, Schneier FR, Smits JA, Stein MB, et al. Social anxiety disorder in DSM-5. Depression and anxiety 2014;31(6):472-9. Ghazwani JY, Khalil SN, Ahmed RA. Social anxiety disorder in Saudi adolescent boys: Prevalence, subtypes, and parenting style as a risk factor. JFCM 2016;23(1):25-31. Bandelow B, Michaelis S. Epidemiology of anxiety disorders in the 21st century. DCN 2015;17(3):327-35. Wang H, Zhang R, Chen Y, Wang H, Zhang Y, Gan J, et al. Social anxiety disorder in the Chinese military: prevalence, comorbidities, impairment, and treatment-seeking. Psychiatry research 2014;220(3):903-8. Fernandez RV, Fernandez SA, Lopez CJ. Quality of life from the perspective of addiction. Revista de calidad asistencial: organo de la Sociedad Espanola de Calidad Asistencial 2016;31(1):3-9. Ferreira FAP, de Almeida-Neto C, Teixeira MCD, Strauss E. Health-related quality of life among blood donors with hepatitis B and hepatitis C: longitudinal study before and after diagnosis. RBHH 2015;37(6):381-7. Dixon LJ, Stevens EN, Viana AG. Anxiety sensitivity as a moderator of the relationship between trait anxiety and illicit substance use. PAB 2014;28(4):1284-9. Villarosa MC, Moorer KD, Madson MB, Zeigler-Hill V, Noble JJ. Social anxiety and alcohol-related negative consequences among college drinkers: Do protective behavioral strategies mediate the association? PAB 2014;28(3):887-92. Knofczynski GT, Mundfrom D. Sample sizes when using multiple linear regression for prediction. EPM 2008;68(3):431-42. Connor KM, Davidson JR, Churchill LE, Sherwood A, Weisler RH, FOA E. Psychometric properties of the social phobia inventory (SPIN). The British Journal of Psychiatry 2000;176(4):379-86. Tsai C-F, Wang S-J, Juang K-D, Fuh J-L. Use of the Chinese (Taiwan) version of the Social Phobia Inventory (SPIN) among early adolescents in rural areas: reliability and validity study. JCMA 2009;72(8):422-9. Bonomi AE, Patrick DL, Bushnell DM, Martin M. Validation of the United States' version of the world health organization quality of life (WHOQOL) instrument. JCE 2000;53(1):1-12. Brener ND, Kann L, McManus T. Reliability of the Youth Risk Behavior Survey. JHSB 2002; 32(1):80-99. Krause D, Folkerts M, Karch S, Keeser D, Chrobok AI, Zaudig M, et al. Prediction of Treatment Outcome in Patients with Obsessive-Compulsive Disorder with Low-Resolution Brain Electromagnetic Tomography: A Prospective EEG Study. Front Psychol 2016; 22(6):1993-12. Rodebaugh TL, Heimberg RG, Taylor KP, Lenze EJ. Clarifying the behavioral economics of social anxiety disorder: effects of interpersonal problems and symptom severity on generosity. CPS Science 2016;4(1):107-21. Grant BF, Hasin DS, Blanco C, Stinson FS, Chou SP, Goldstein RB, et al. The epidemiology of social anxiety disorder in the United States: results from the National Epidemiologic Survey on Alcohol and Related Conditions. JCP 2005;66(11):1351-61. Foster DW, Garey L, Buckner JD, Zvolensky MJ. Social Anxiety and Cannabis-Related Impairment: The Synergistic Influences of Peer and Parent Descriptive and Injunctive Normative Perceptions. SUM 2016;51(7):912-21. Ecker AH, Richter AA, Buckner JD. Cannabis-related impairment: The impacts of social anxiety and misconceptions of friends' cannabis-related problems. Addictive behaviors 2014;39(12):1746-9. Ramsawh HJ, Chavira DA. Association of Childhood Anxiety Disorders and Quality of Life in a Primary Care Sample. JDBP 2016;37(4):269-76. Barlow, DH. Clinical handbook of psychological disorders: Astep-by-step treatment manual.4nd ed. New York: Guilford Press; 2008:111-17. Baumeister RF, Leary MR. The need to belong: desire for interpersonal attachments as a fundamental human motivation. Psychological bulletin 1995;117(3):497-529. Aspis I, Feingold D, Weiser M, Rehm J, Shoval G, Lev-Ran S. Cannabis use and mental health-related quality of life among individuals with depressive disorders. Psychiatry research 2015;230(2):341-9.